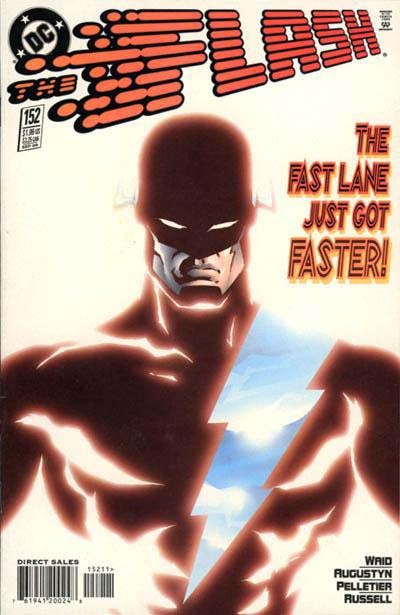 In 1995 the previous FLASH logo was revised by Chicago designer Alex Wald, giving the previous backward-leaning letters a forward slant once more. Alex also added a stylish THE with similar points, and a loose but attractive lightning bolt running behind the letters, connected to the drop shadow. The letterforms are similar but not identical to the previous one, but still derive most of their motion from the extended points at the top, now enhanced by the forward angle. Wald also designed the IMPULSE logo that same year, in a similar, and in some ways mirrored style. This one has more bounce, appropriately for the youthful hero, and instead of receding seems to be coming toward us. 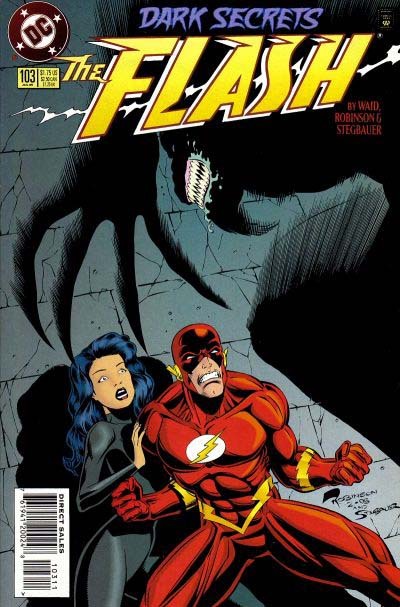 For this arc, a new Flash, called the Dark Flash temporarily took over the title. Rian remembers: if I recall, there was something in the story about Flash being digital, or made of pulses of light… I can’t remember exactly! Anyway, the logo took that idea as its starting point. Rian’s modern design sense and attraction to rounded forms are evident here, and while I don’t think it would have worked long-term, it’s a fine logo for an eight-issue storyline, though Curtis King has told me it was controversial at the time. John’s memory of this assignment was that he was asked to stay as close to the Ira Schnapp Silver Age Flash logo as possible, and I think he’s done it quite well, while at the same time giving the design an attractive, modern look. The final version, which I think is exactly what appeared on the covers, uses the Schnapp letterforms, but with a much heavier outline that joins the letters together. The Schnapp speedline approach is used, but with the lines mostly apparent in the lighter color of the inside fill against the dark outline of the letters and deep dropshadow. I think it’s very effective. 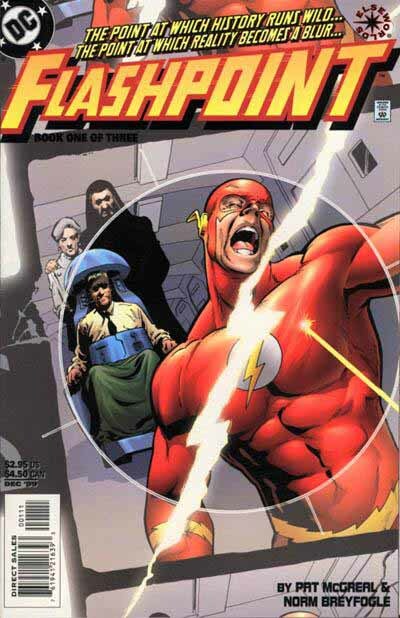 So did Curtis King, at DC, who decided to use the FLASH part on the regular series right after the Rian Hughes logo story ended in 2000. For this version, Curtis increased the height of LASH, bringing them even closer to the Schnapp version, and added an attractive THE in an upper and lower case reminiscent of Schnapp’s, but again more modern. I think this logo does an excellent job of capturing all the best design elements of the Silver Age logo, but rethinking them in a modern way. 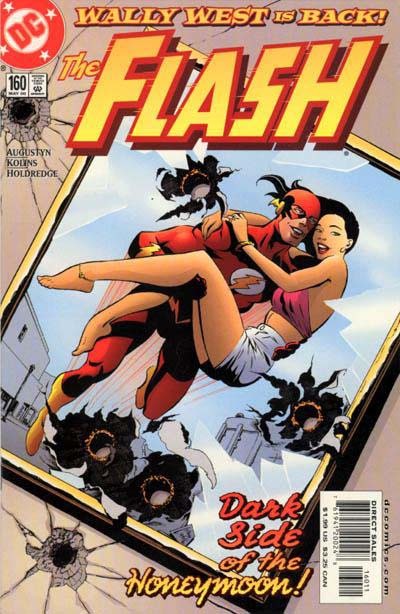 It remained on the covers from 2000 until the series was cancelled in 2006 with issue 230, a pretty long run in modern times. Then a new series revamp began, and John J. Hill was once again tapped to design the logo. Here are some of his design sketches. Kenny Lopez asked me to work on the Flash relaunch. The direction here was to do an update to the original… bringing it into the 21st century but definitely being recognizable as the iconic Flash logo that we’ve seen all these years. The first two (which is the direction ultimately chosen) was where I started. I began by recreating the characters and toying with the perspective to make it a little more extreme. The biggest change obviously is losing the subtle speed lines and replacing them with extruded elements and lines cutting into the characters. The next three (which I focused on more) was a bit more of a departure as far as perspective goes. One thing that I always liked about the character was seeing how different artists would convey speed FX. What always stuck was when you’d see certain elements stretch, like the lightning bolts on his costume and the wings on the sides of his head… This is something I tried to pull off with this version a little more. “The” being those wings on his head. I had an idea to use some non vector speed FX (as you’ll see on the bottom version) but that never really seemed to work that well so I dropped it pretty quickly. Looks to me like they went with his first sketch, though there are minor changes. The speed point at the bottom of the F is gone, as is the drop shadow (at least on this cover). 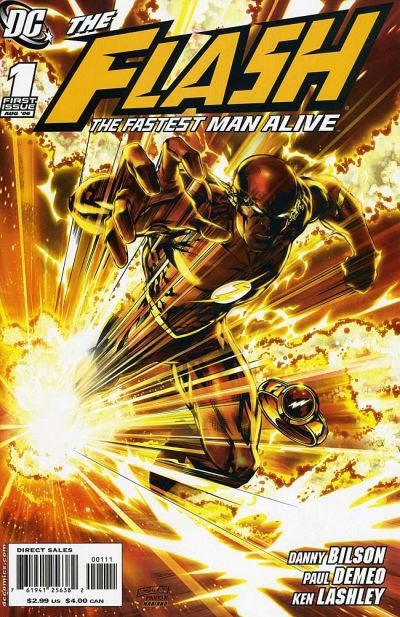 THE is now open and has a small dropshadow, and a tagline THE FASTEST MAN ALIVE has been added to the logo and the book’s title. I like the logo, and think it once again combines some design elements from the Silver Age Schnapp one with modern techniques. The large triangular speed points work fine for me, as they did back in the 1980s version by Bové, Wilson and Bruning. The outline is bold, heavier at the right and bottom, effectively a dropshadow look without a separate shape. It still conveys speed, fills the logo area nicely, and captures the essence of the character. Well done. This revamp didn’t last long, though, and about a year later it was cancelled, to make way for the return of a relaunch of the previous monthly, resuming that numbering. The logo by Hill continued, but with some modifications by staff designer Ken Lopez, who added some Photoshop blurs and a new lightning bolt running across the front. And so it remained until the end of this series. 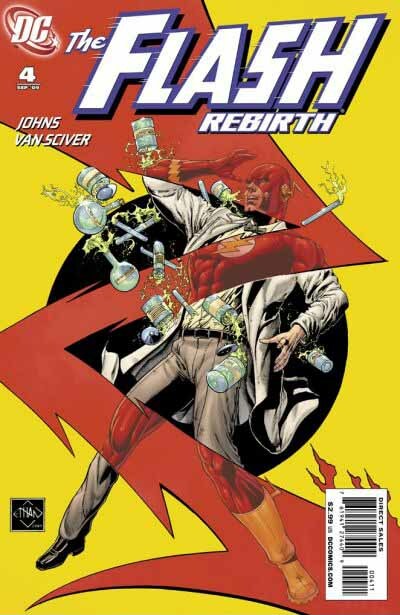 In 2009 the long-lost (and presumed dead) Barry Allen returned in a relaunch, FLASH: REBIRTH. The logo returned to the 2000 John J. Hill version with a new tagline. To my eye it still looks fresh and relevant. 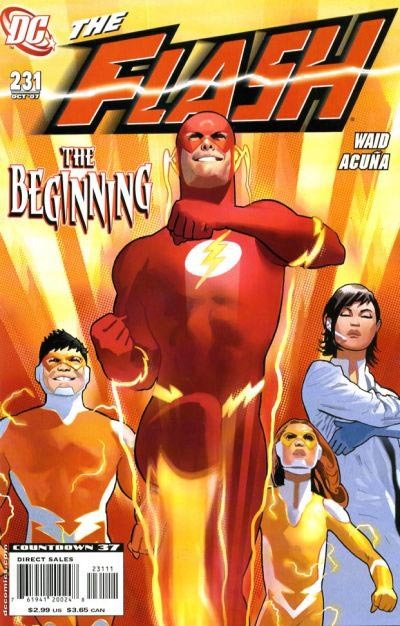 So what is the essence of THE FLASH’s logo? The recurring themes of speed lines, a forward lean, and a lightning bolt all point to it: SPEED. I think the more speed expressed in the logo, the better it works for me. Ira Schnapp’s version remains the high mark, but other versions since then have built on his foundation with great results. Hope you’ve enjoyed this latest logo study. More chapters and other logo studies are on my LOGO LINKS page. This entry was posted in Logo Studies on April 23, 2008 by Todd. I hope they use that first Rian Hughes one in 2012! It’s amazing, and perfectly “futuristic,” which fits great with a character who can (sometimes) manipulate time. 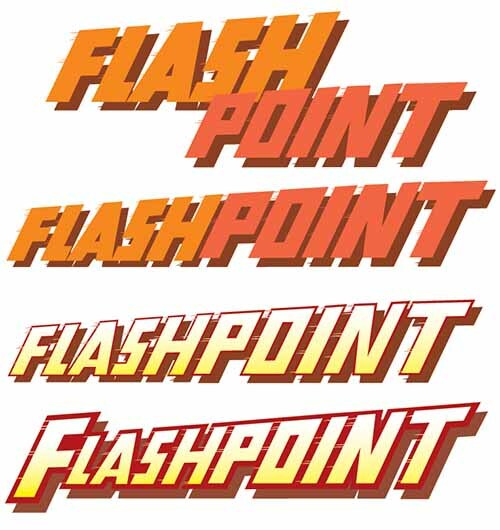 That was simply fascinating – there are at least three logos I’d love to see used regularly – Rian’s first speedline logo, John’s blocky drop shadow ‘Flash’ in the first Flashpoint sketch (I don’t remember that book at all!) and his ‘non vector speed FX’ version – possibly my favourite of the lot. You letter artists are a super-talented lot. Thanks! Thank you for one of the most interesting logo studies yet! The Ira Schnapp logo is classic Flash to me. The longevity of the design speaks volumes about it! I think Aquaman or The Legion of Super-Heroes would be great candidates for future logo studies! You’re welcome, Roger, but I did Legion last year, one of the first logo studies. Check the “Logo Studies” sidebar for the full list. I also love Rian’s first one (had forgotten all about that Dark Flash story), but my favorite unused one here has got to be John J. Hill’s 3rd one down. His idea of using “the” to evoke Wally’s earpieces is very cool. I always thought the cursive “the” felt tacked on. And the extreme tilt of the letters means no speed lines are needed, just a few strong points. While I love some of the old logos, I think Illustrator (or whatever software) really expands the ability to do crazy perspective more accurately and easily.